We have upgraded our transport packages to offer larger, more dependable, customer built tandem carriers to ensure drill units can be safely transported to site. Where larger transports are required, Core Drilling has purchased new trailers and powerful dependable tractors. Core Drilling has a highly regulated fatigue management program to ensure we operate within provincial regulations. 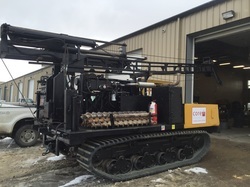 Core Drilling acquired this 2011 D-120 in Dec of 2017. The D-120 is our most powerful tracked drilling unit and is ideal for large deep scope drilling programs in both geotechnical and environmental applications. 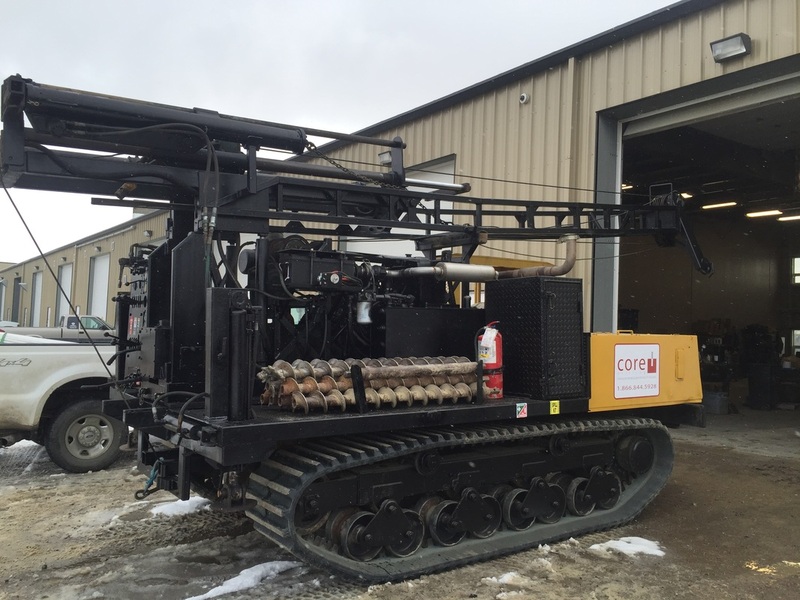 The unit is set up for HQ3 coring, ODEX, air rotary, hollow stem and solid stem drilling programs and is mounted on a Bombardier Go Tract for low ground pressure and remote access sites. 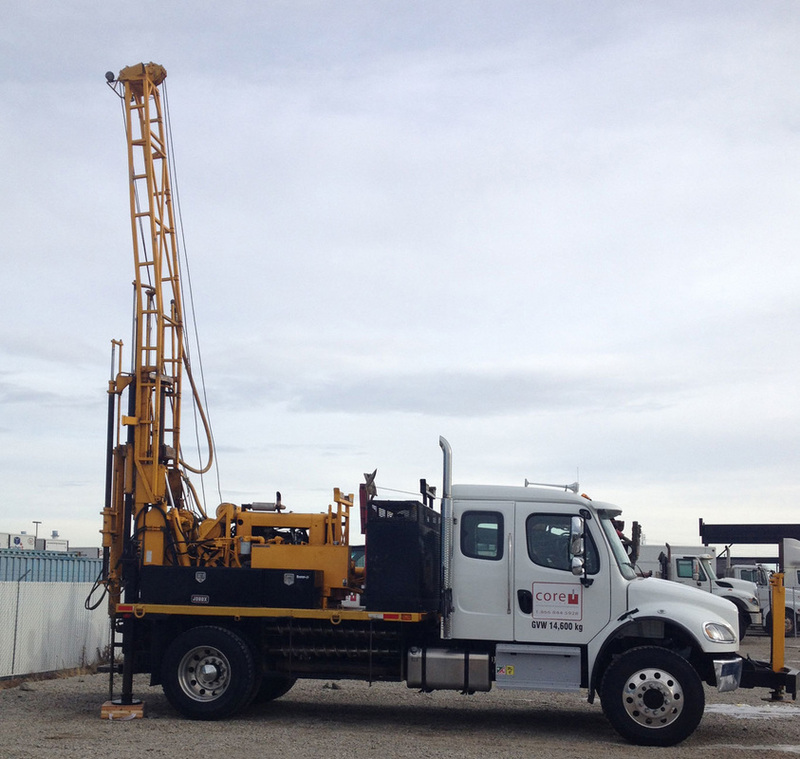 The C-211LGP drilling unit designed for remote or difficult access locations. The C-211LGP is mounted on a tracked carrier to lower ground pressure. The C-211LGP unit is ideal for all-season drilling programs. Standard features include 6" solid stem auger and core sampling tools. ​The C-411LGP is mounted on a low-ground pressure rubber tracked Morooka 800 two-speed carrier. This larger, more versatile drill offers 11 feet of stroke and has a large deck to allow for transportation of monitoring well materials to your remote work sites. Standard features include 4.25 ID hollow stem auger, 6" solid stem auger and core sampling tools. The B-33 Mobile Geo-drill is mounted on a 4x4 buggy with low ground pressure float tires. This mobile drill offers two wirelines with standard features including; SPT hammer, water pump, 3.25 ID hollow stem auger, 6" solid stem auger and core sampling tools. This unit is also air rotary and ODEX ready. ​The Mobile B-59 Geo-drill is mounted on a Morooka 1500 low ground pressure rubber tracked carrier. This drill is one of our most powerful drills in our fleet and is equipped with 3 winches, a 3L8 Myno pump and SPT hammer. The unit is set up for a variety of drilling techniques including: air rotary, NQ/HQ coring, hollow stem/solid stem auger, ODEX and split spoon sampling. Our Morooka 800 support track unit has a 4 cube heated water tank mounted on a flat deck with additional space allocated for tooling or material handling. 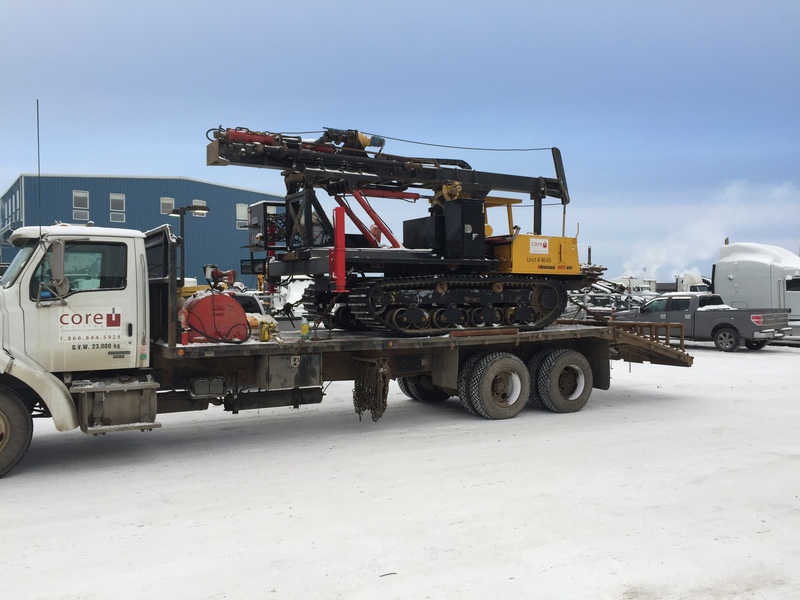 These Enviro-Drills were designed by DB Engineered Hydraulics in Red Deer and are mounted on a Morooka 800 tracked carrier. The DB Enviro-Drills have 10 feet of stroke and high rotary torque to ensure successful soil sampling in difficult soil conditions.